Another day, another Lanvin for Ms. Kamineni. Wearing the lamé dress with a matching Leiber clutch and mirrored Prada pumps, she attended a charity dinner in Hyderabad recently. Though the faux-wrap dress worked on her, its styling let her down. The orange-red lip color helped break up the metallic-monochrome but not nearly enough. The look would’ve greatly benefitted by some minimalist sandals. It was a Lanvin dress for Upasana while at the Awards event last night. Wearing her hair up, she finished out the look with a pair of diamond earrings, Christian Louboutin evening bag and Miu Miu pumps. The choice of dress was unexpected and it worked. But the look itself wasn’t quite a ten. Given the slight high-low hem, a pair of ankle-strap sandals would’ve worked a whole lot better. Those and a pair of more understated earrings would’ve taken this look up a notch, n’est–ce pas? Wearing Anamika Khanna, Upasana attended a reception in Hyderabad. For the soirée, accessories of choice included a Bottega Veneta clutch and sparkly pumps. She looked nice! 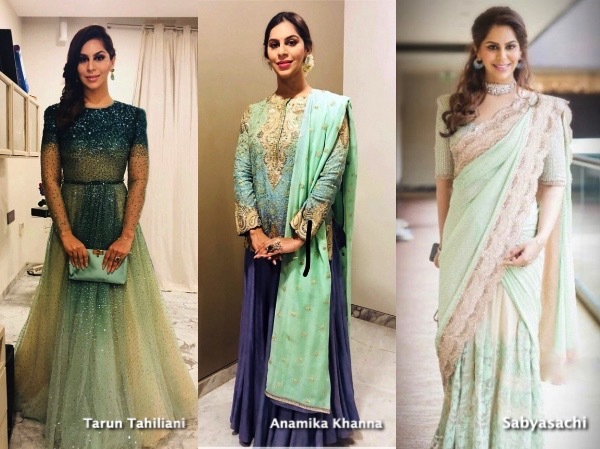 One to favor Anamika Khanna quite often, Upasana attended her father-in-law’s 60th celebrations wearing a Tarun Tahiliani gown instead. With her hair worn half-up, she finished out the look with diamond jewelry, red lip and an Alexander McQueen clutch. Lovely as she looked neck-up, we just couldn’t get on board with the gown itself; not a fan.